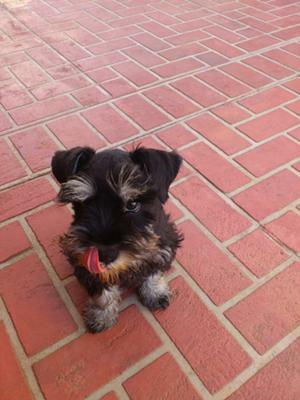 We have had our Schnauzer for 8 weeks now and he is now 16 weeks old. We keep him inside during the day when we are at work and we take him out in the morning, at lunch and after work for exercise and play time and just so he can sniff around. Our question is, at what age will it be safe for use to leave him outside whilst we are at work? We live in a part of Australia where there are significant numbers of Brown Snakes and Tiger Snakes and so I thought to ask you for your opinion. Luke, Hayley and Reuben (the mini) in Oz. Comments for What age should our mini schnauzer be left outside all day? I would never consider leaving my (Schnauzers) dogs outside alone for very long, even in a fenced in yard, without keeping an eye on them.That's just common sense. So I cannot imagine anyone even considering leaving their puppy outside all day. Noone there to make sure he does not get into trouble, as puppies so frequently do, ingest anything harmful, or in your case being ingested by something. I have to question if you're playing with a full deck ? Pity the puppy who landed in your hands ! I've always had the understanding that schnauzer's can overheat easily and should be in door pets, not outside all the time. Its fine to take them on walks and let the out to play but outside all day in Austrialia may not be a great idea. I live in Florida and take my schnauzer on some long walks. He does great on the walks when the weather is cool during the winter but when the temp is over 76 F we stick to shorter walks in the shade because he gets hot pretty quick. While he is fine playing outside for small periods of time, I can't imagine leaving him outside all day. I'm not sure what your weather is like in Austrialia but I think it may be hotter than Florida and that you may want to reconsider and keep your cute pup as an indoor dog. I don't know if you are worried about potty accidents, but when my dog was a puppy and still had accidents I took him to doggie day care while I was at work or had a dog walker take him out in the middle of the day. This gave him indoor and outdoor play time and made sure he had potty breaks. Now that he is older and can control his bladder he can stay home for much longer and doesn't need doggie day care or dog walker. When I am gone he monitors himself and doesn't drink much water until I return. He never has accidents & is a great indoor dog. Plus schnauzer's love being with the family. If I'm inside he wants to be inside, if I'm outside he wants to be outside. Under the circumstances you have mention, I'd never allow my dog out without an adult or responsible teen close by.